AZURE DOODLEBLOG: [ASIFA SKETCH] Short or Long? I haven't been to the model sessions lately for various reasons, but last night I managed to attend one. Though there are whole lot of practice I need, the people sketches I have been doing in order to supplement the missed opportunities seemed to have paid off a little. It looks like though, those sketches has changed my preference of life drawing. Since I started my drawing with long pencil render sketches, I have always preferred sitting and staring at the one thing for hours and trying to get every crease right, so I have been liking the longer 4~5 mins poses, but I seemed to have enjoyed the 2~3 mins ones last night. Part of me is still extremely bugged when I see that my proportions are wrong, but part of me is telling myself that I probably should --not totally ignore, but focus more on the motion for the shorter poses, and feel my lines got more...uh...reckless? in a good way I guess, than my 'scared-to-put-it-down-on-paper' kind of lines in my past sketches. I don't know, is this a good thing of bad? Either way, I think I have to kind of partition my brain. 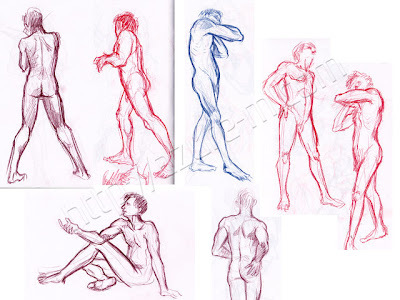 I do want to study the proportions well and do want to study the more overall, action-muscle-relationship too. I guess until I get used to one or the other, I should tell myself 'this pose I focus on anatomy' 'this pose I focus on motion' and stuff. Anyho, lots to learn. Bring it on.